Discussion in 'DMX, E1.31 & Networking' started by ShellNZ, Sep 25, 2014. Since everyone is in the networking mood, I have a dilemma like others. I posted on it last year but cant find the post to renew it. Firstly, I am unicast. I have 2 NIC cards in PC, one for internet, one for E1.31. I had someone look at the problem via teamviewer last year so it was likely him that changed the above as I dont think I would have (especially the DNS change). When it comes to testing this year I would really like to be able to Teamview into show machine while standing outside, but I cant have the internet going at the same time as LOR running. With internet plugged in as soon as I start LOR control panel the rest of the network turns to crap, including wireless devices e.g ipad, laptop. My internet NIC goes to a modem/router switch, I also have another switch off that and have tried plugging it in the plain ole switch as well, no difference. The person who Teamviewed in to my machine last year did a few things with Nortons thinking it was Nortons that was causing it. This year I dont have any firewall except for Windows one. LORCommListener is allowed through Win firewall. I can probably turn firewall completely off but surely I tried that last year and it didnt work. As soon as I unload LOR control panel Im back on again. I brought a USB->ethernet dongle a while back for other reasons, tried that for internet, same problem of course. Anyone out there who can help me problem solve? JCMarks has the same problem except that he uses HLS so is wanting to try any suggestions as well. 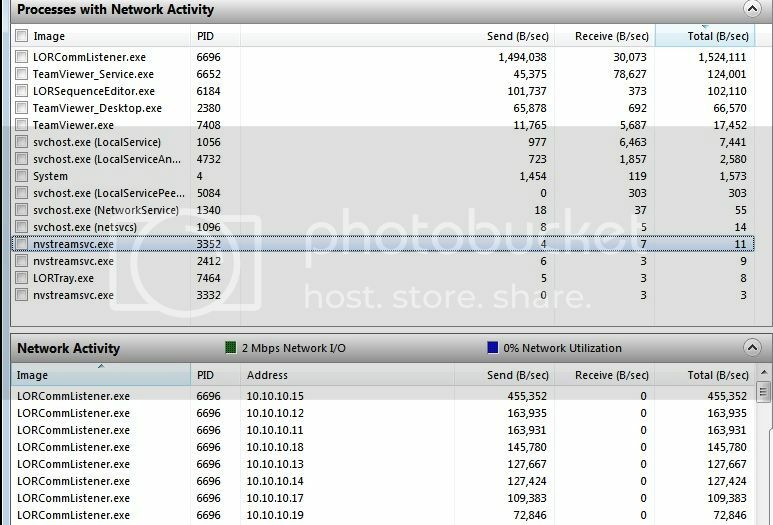 Suggest you get Wireshark ( http://www.wireshark.org ) install that on your machine, get it to capture a sample of the traffic on the interface thats going to your 'internet' side, so we can see what it is. Then theres no guessing, on how to fix it. So Shell, if my understanding is correct, even when using unicast and a separate network card, in the end it is the LORcommlistener that is preventing the use of the internet at the same time. lol @ bundy, yes, I use unicast and separate NIC for E1.31. I had a play in Windows firewall then ended up disabling it (all 3, public/domain/private). I also created a connection rule in Windows firewall and had a play but then deleted it. 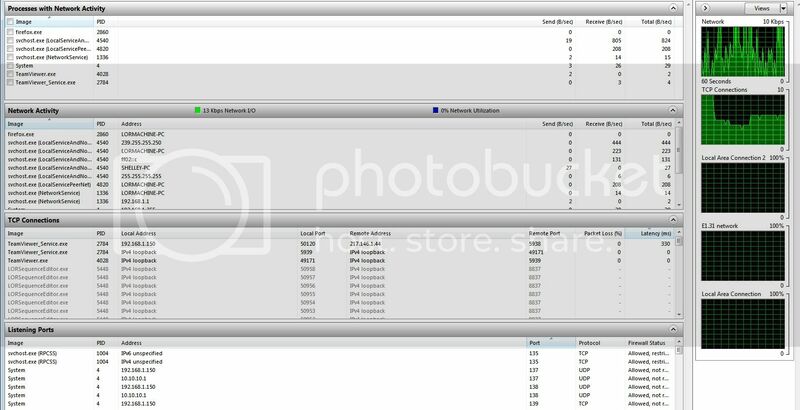 I then started Resource Monitor and had a look at what was using net. Jumped on ipad and started teamviewer and connected to show machine. Then I opened LOR seq editor & LOR Control Panel (commlistener). Teamviewer was still running, so started a sequence and it worked!!! Have just taken ipad out to road and all good, the sound lags of course but dont need sound as I have headphones for testing time. At least I can stop/start my show from outside instead of running back and forth 100's of times. The connection on my home computer either lags or dies but thats OK, dont need it when Im testing. I took some screenshots of Resource Monitor when LOR running and when its not as below. I soon got rid of the Nvidia streaming thing, chose "Do not stream" in Nvidia GeForce Experience and also went into services and stopped the service from running and made it manual. So thats not coming up now. Once I start a sequence playing after a minute wmplayer.exe shows up, understand that is part of the LOR bunch so thats fine. Interesting that the matrix controller (10.10.10.15) is the highest data sender as its not plugged in, nor was it part of the sequence I was playing. Another thing I did was removed the show computer from Homegroup. I also found it hard to run internet while running E131. What I did was got myself a little ethernet to usb dongle. Why does anyone use LOR software ? You pay a lot for it, and then it needs a dedicated LAN...... doesn't sound right to me. LOR doesn't need a dedicated LAN. I use S3 Advanced on my home network with no issues. The most likely cause is the Multicast is going to the wrong network card. Vixen force you to select a network card, I think new versions of Xlights allows you to select a network card. I have gigabit Ethernet at home, so not really an issue. Plugged your PC/Player into a switch which supports IGMP Snooping first, then connect the switch to the ADSL/Wireless router (assuming it does not support IGMP), the wireless network should not see any multicast packets as the switch (with IGMP) will not forward the packets to the ADSL/Wireless router. Assuming no IGMP in ADSL/Wireless router, buy two switches with IGMP. As your using Unicast to 10.10.x.x IP address your internet network card (192.168.x.x) should not see any E.131. packets. I would expect it to be a CPU or computer bus issue, or both network cards are using the same IRQ. (try a different PCIe slot. If you look under device manager you should be able to find the IRQ in use, I hope it is not sharing with any device/card which would be busy on the computer). Damona, how do you find out if it is sharing an IRQ (interrupt request?). I look up one of my adapter cards and it says 0xFFFFFFF9 (-7) and the other says 0xFFFFFFF7 (-7). I gather these are not sharing but how to tell if anything else is. If my modem/router is IGMP then I can just plug the lights network into this and no need for a switch? John, I do have one of those usb-ethernet dongles as well, doesnt make a difference as its still running off the LAN. My problem wasnt wireless like others, Im on a LAN. Shell, download wireshark, sniff your network ports when your running it, get the pcap file and well diagnose it in a few minutes. No guess work. Negative IRQ is explain here http://en.wikipedia.org/wiki/Message_Signaled_Interrupts Their was an impact on the old fashion version of IRQ (positive), not sure about MSI (negative IRQ). If you have an ADSL/Wireless IGMP Snooping router, it should not send packets to the wireless network (assuming you do not have any E.131 devices on the wireless network). It could be a LOR software issue????? You need to capture packets on both network cards, and ensure you do not see any E.131 traffic on your 192.168.x.x network. Thanks Andrew, I got wireshark and watched it for a while, realised it was reading soooo much off my work computer (what I use 24/7, this one). So I then took the show computer off the homegroup. I also turned off Network discovery and file sharing. As mentioned, I dont really know if that made a difference as I didnt try Teamviewer before I mucked around with everything, just assumed it still wasnt working the same as last year. Last year I could only just connect, then it would disconnect (on iphone). This year am using an ipad, may be stronger wireless signal, not sure. I have to connect with Teamviewer BEFORE I start up commlistener.exe tho, cant connect the other way around. Oddly while commlistener.exe is running the network/internet icon on show machine has the yellow exclamation mark on it, so "not connected properly" yet there I am in teamviewer. Shell has LSP, but felt she didn't have time to learn it fully. Not sure how it did converting her LOR files right over. After reading about her adventures cramming and tricking channels for rgb, and her LOR adventures in software land, I am SOO glad I just bought LSP in the beginning and will never have to deal with that.